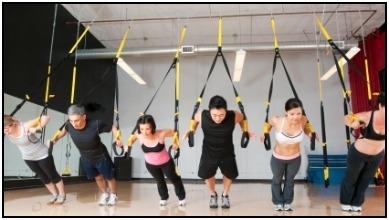 TRX fitness is a new method of suspension training that has become popular in recent years. It focuses on using your own bodyweight as resistance, as opposed to free-weights (dumbbells, kettelbells, barbells, etc.). Already done TRX suspension training? Share what you like (and don't like) about it here! What's The Deal With TRX Suspension Training? TRX fitness and suspension training was created by an ex-Navy SEAL, Randy Hetrick, founder of company Fitness Anywhere, Inc. He designed it to be an extremely portable way of working out virtually anywhere. The apparatus consists of a harness with two handholds of adjustable length. You can hang it from beams in your house, a closed doorway, bars, trees outside, etc. Then you just start doing your exercises. Pull-ups, elevated push-ups, standing rows, one leg squats… The list goes on and on. Suspension training itself isn't new. Gymnasts have been doing suspension training for decades on the rings, but its only recently been introduced to most of the general public. The TRX Suspension Trainer Professional package comes with the TRX harness equipment, a 25 minute DVD with a sample workout and directions on how to do exercises, and a booklet that shows you how to do the most popular TRX exercises. It all comes in a small drawstring mesh bag, so you can pack it up and take it with you easily. TRX fitness training was featured on The Biggest Loser. It worked great for them to build strength and lose weight with. Probably the #1 reason to do TRX fitness training is because it's so portable. It fits in a small bag that you can take anywhere with yourself. Also, it's great for working your stabilizer muscles. Doing a push-up is pretty easy, but when your hands are suspended on ropes you reallyneed a stable core to do it. There are over 300 exercises that you can do with it. So, you're never gonna get bored. Adjusting the exercises for your own strength level, or even your fatigue level, is also easy. Simply change the position of your feet or hands to make each exercise harder or easier - no mucking with weight plates. And you can get specific exercise programs at Fitness Anywhere's website for strength, flexibility, keeping a healthy back, tennis, golf workouts, and more. Very convent. One of the main drawbacks to TRX suspension training is that the set a bit pricy. It retails most places for about $110.00, which is on the expensive side for just a harness, bag, DVD, and booklet. It's portability is great if you travel a lot. But, do you really travel so much that you need your own equipment? All in all, I think it's a great product. If you like it and use it regularly, believe me, it's defiantly worth it to drop the hundred dollars for something that you'll use regularly for years. The bottom line is, do you really like it? Does it work for you? You can probably try it out at your local gym, or take a look at the reviews below and see what other visitors think about it. Love or Hate TRX Suspension Training? What do you think about TRX suspension training? Great results? Is the suspension trainier good quality? Do you have a great story about training with it? Review it down below! Entering your review is easy to do. Think of what you enjoy about TRX suspension training, what you dislike, what quality the equipment is, how easy it was for you to learn the exercises... and then just type it up below! • Click here to learn more about different Strength Training Routine & Workout Info! • Click here to leave 'What The TRX Fitness Craze Is...' & go back to the Complete Strength Training Home-page!